With the introduction of LED technology, its flexibility in light spectra has generated new opportunities not only to save energy, but to provide versatility in what can be achieved with artificial lighting. 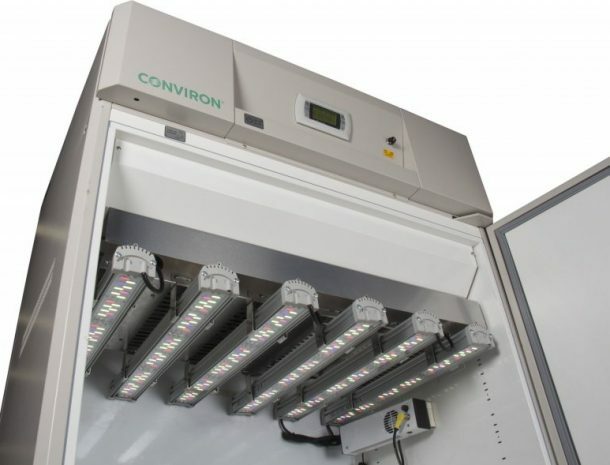 Valoya’s wide product selection includes models suitable for various growth environments, from small growth chambers to large walk-in rooms and greenhouses. For creating highly controllable integrated systems for chambers and rooms Valoya is collaborating with Conviron. Valoya provides various spectra specifically tailored for all plant growth phases. In addition, Valoya offers narrow bandwidth spectra ranging from UV-A to far-red, enabling customised spectral solutions for photobiological research. Valoya products can be used to create low and high light intensity solutions (up to PAR 1500 µmol) with various dimming options. The right light spectrum gives researchers the opportunity to optimize their research. For generic research, Valoya offers a ‘standard white’, the NS1 spectrum which has a high sun match with excellent visual properties. Valoya also offers solutions with highly accurate daylight simulation of any geographical location. Cooperation with IT companies like Microsoft® has enabled first class SW & HW integration resulting in optimal natural light simulations. Valoya’s products are designed to have a long use life, typically rated at 90% of initial output at 35000 hours, which is 40% more than Dutch competing products. The L-series (tubes) have a lifetime which is up to 4 times longer than typical Dutch research TLEDs. The long use life is a result of excellent thermal properties of the LED fixture and the high quality power units used by Valoya.